Or slipper socks, or both if you are really going for it! Nothing feels better than putting your feet into a lovely fluffy pair of slippers on a cold winters evening! Primark do, some amazing slipper socks and slippers ( I personally recommend the Harry Potter ones) or you could go high end! All that matters is they are over the top fluffy and incredibly warm! Got to give those feet that TLC. Just like slippers and Socks nothing beats getting into a fresh pair of PJ's! Primark do some lovely ones which are heaven and 10 out of 10 on the cosy scale ( if that was a thing) however after a few washes they can become a bit old and tired looking which is the perfect excuse to keep buying more! Trust me, ask any blogger it's their favourite thing to buy besides rose gold homeware from H&M home. #3 LUSH, IS A GOOD SHOP IF YOU HAVEN'T TRIED IT! 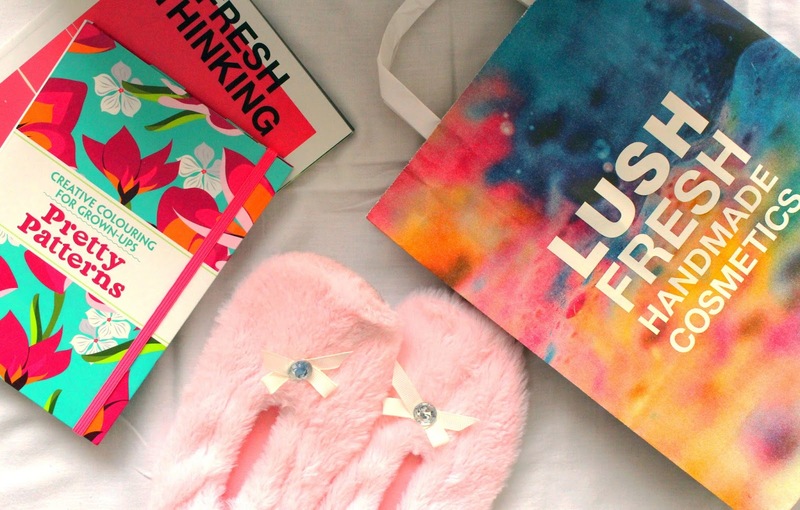 Another classic favourite of bloggers, Lush is the perfect shop to go in if you want some bath bombs or shower gel to make you feel million dollars that are always kind to bunnies! I am not the biggest fan of Lush because I don't have time to have baths ( I know, I know I need to take my own advice) but seriously the smell of the shop is mind blowing and I love it! I'm the sort of person that would just go in the shop and smell everything as an activity to relax. Most normal people would actually buy something! I am not going to be the first person to admit that after a day at college working I come home and do more work and consequently find if very hard to get out of this routine! I think it's very important to dedicate some of your time in the week to a hobby that is different but is still relaxing! These don't have to be expensive! Having movie nights, pamper evenings, listening to new music on Spotify or colouring books are just a few suggestions of things you could do! In the winter especially it is easy to neglect our bodies a bit with the temptation of hiding under all those layers. However, after a while, it makes us feel a bit poopy about yourself! A really inexpensive way to do this is making sure that you are looking after yourself as much as possible! This includes washing hair, removing unwanted leg hair and not binge eating! Doing these things can make you feel pretty rubbish. Although they may not be seen as treats they can definitely help improve your self-esteem in the colder months! Now I am not Merry Berry or Kristy Allsopp and I am not all that crafty but luckily for you there are so many bloggers out there are on stand by with hundreds of cheap DIYS for you to do for all seasons to help treat yourself on a low budget from bath bombs to hand cream! Go on give it a Google and I am sure you will find yourself on Pinterest for hours! And that's it! I hope you enjoyed this quick rundown of six super easy but inexpensive ways you can treat yourself when you are next feeling a bit stressed or dishevelled. Do you let me know what you do in the comments below to treat yourself on a budget! Was it any of these things? If not, do you have other secret tips you need to share? Lush is always a good treat for me, even if I'm just shopping the Lush stash I have at home. A nice bath bomb always puts me at peace. Such a good post! Building up a little lush collection is so satisfying! I love Lush products! They smell amazing! I like to plan a lazy day every now and again, when I know that I will have less work to do and can just do whatever I want to - which is normally either write or read a book! I love just cuddling up in a good pair of jammies! and i always enjoy a trip to lush once in a while, if i go more often i'll spend a fortune! How have I only just found your blog? Love it! Also love this post,theres nothing better than getting cozy and having a little lazy day to treat yourself! I can definitely relate to number two, I am constantly buying new PJ's - they're my favourite things to buy! Oh my gosh, I could get lost in Pinterest DIYs! I'm really into cross stitching to relax at the moment, but if all else fails a little pamper session & some loud music is perfect! I completely agree with you, I got given some slippers which are really good quality and I love them so much, and wear them the entire time! Sounds ridiculous but they are such good investments. If I want to treat myself on a budget I just like taking time out, making myself a dinner which I really love and spending time pampering or making extra effort with my skincare, maybe fake tanning & doing my nails. This is a lovely post! I agree about the PJs thing. It's the best feeling to get in after a long day, put on PJs and socks and watch a film! I absolutely love LUSH! I find it is the perfect way to relax me! I love your blog, it is so cute! Loved reading this post and it will definitely come in great use to so many people (including me)! Having a bath always feels like a lovely treat!